Director: Phyllida Lloyd. Writer: Abi Morgan. Cast: Meryl Streep, Jim Broadbent. What could have been an insightful, challenging and even controversial film about one of the most loved/hated politician of the twentieth century, instead ends up being just an empty vessel for Meryl Streep to showcase once again that she’s Oscar worthy! As if we didn’t know that already… The most Oscar nominated living actress in history really does indeed become the British Prime Minister in the “Iron Lady”. Unfortunately Meryl alone is not enough to lift an otherwise flat and quite superficial biopic. Some may argue that sometimes her performance veers slightly too much towards parody, but that’s mainly a problem with the staging and the direction of the film itself. “The Iron Lady” is trying too hard to please everyone that in the end it just disappoints everyone. It wants to be too much like “The King’s Speech” (there’s even a scene which feels lifted directly from it, where Margaret Thatcher is rehearsing her voice… I was waiting for her to stammer at any point), but here the baggage behind the main character is just too big and edgy to get away with such lightness. 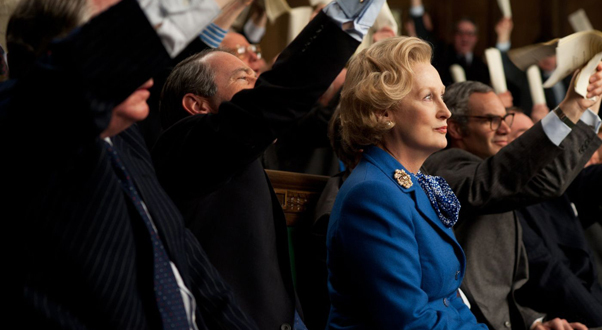 Margaret Thatcher is a complex character with an even more complex life: to try to reduce it and compress it all into a film of less than 2 hours is a tough task and “The Iron Lady” suffers from trying to do it. Major events like the Falklands war, or the miners’strike, are given just a few minutes and it all ends up feeling a little bit like reading a page from Wikipedia: yes, all the facts are there, but it all feels a little bit too superficial… And a film about Margaret Thatcher should be anything but superficial. The film is structured through a series of flashbacks as it also try to give a more intimate portrait of the old Prime Minister in her first stages of Alzheimer. This is probably the most revealing and poignant part of the film (though not without its problems too). Once again Meryl manages to step above the mannerism and the caricature and brings some unexpected humanity into her character as the so-called iron lady becomes now more like an old rusty iron lady or worse a paper-thin weak old woman (with the aid of some impressive make-up. The people behind the make-up in J.Edgar should watch and learn!! ): her performance as an old woman is something to wonder at! However the film doesn’t quite know what to do with all this material and all the characters around Mrs Thatcher. Are we supposed to like this controversial and yet influential British politician? Are we really meant to feel sorry for her? What is it try to tell us by showing the Iron Lady as a weak old woman stricken by illness? It’s all rather too easy to be controversial, and too thin to be thoughtful, too friendly to be considered seriously. In the end all we are left is a marvellous performance for a film that doesn’t quite deserve it. I want to watch the Iron Lady as soon as possible. Pretty sure it will be better than Iron Man. I was blown away by Streep’s performance just from watching the trailer. I knew she would deliver. But at the back of my mind I thought any film about Thatcher was going to immediately divide audiences and the political stance of the film was always going to be a stumbling block no matter where its allegiances were. This was a very interesting read, thank you. I haven’t seen the film yet but I will catch up with it at some point.